Camso brings to market a new and affordable track system for a wide variety of ATVs 500cc or less. Converting a small engine all-terrain vehicle from tires to tracks just got easier and more affordable thanks to Camso’s new ATV R4S track system. It’s long been known in ATV circles that where tires sink, tracks provide much-needed flotation and superior traction. Whether it’s heading off to that remote hunting cabin, checking the farm fence line, or exploring the back country on the weekend, tracks outperform tires in snow and mud. But for some owners of older or smaller ATVs, track system options were somewhat expensive for their intended use. Camso has set out to put that myth to rest by bringing to market an affordable track system for a wide variety of ATVs 500cc or less. Camso spared no effort in designing and building a robust system that can be used year round. 8-inch (20 centimetres) width reduces ground pressure and provides comparable flotation and traction to wider track systems designed for larger cc vehicles. Sprockets are adapted to prevent clutch and engine overload. Optimized geometry of the system ensures optimal performance and handling. 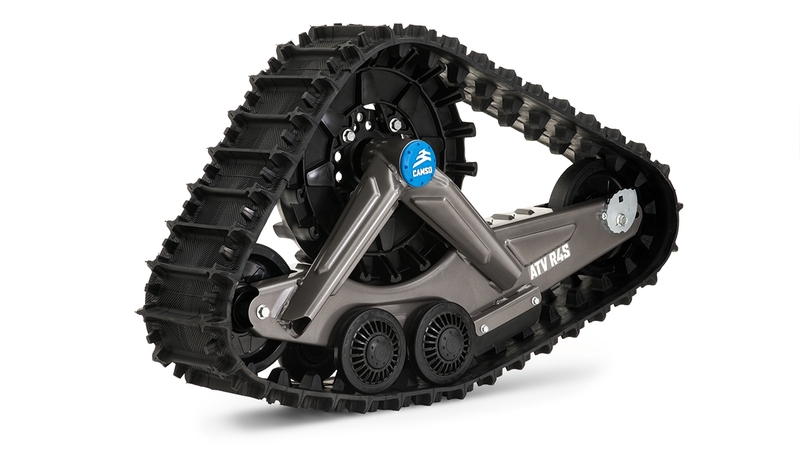 The ATV R4S is the perfect track system to take your ATV further than ever before, for less. It makes all-season off-road mobility accessible for more riders. The new track conversion system fits almost every 500cc and under ATV model on the market and is intended for lighter-duty applications such as ice fishing, hunting, farming, reaching the cabin — whatever your way to play. Backed by a two-year limited warranty, the ATV R4S is available through Camso’s dealer network.